Home Cabernet Sauvignon Maryland Mechanical Grapevine Planting Pinotage Planting Vineyards Sauvignon Blanc Vineyard Viticulture Wine Growing great wine - Maryland's Wine Country! Growing great wine - Maryland's Wine Country! White hybrid grapes: Vidal Blanc and Traminette. 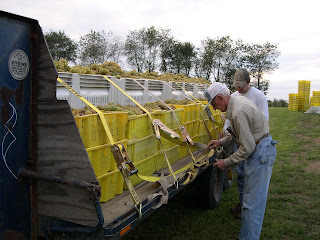 My father-in-law and husband strapping down a load of grapes for delivery. Each of these varieties was planted at the request of a Maryland winery who was looking for a supplier of a particular variety. The only exception is Pinotage. Pinotage is a South Africa variety which is a cross between Pinot Noir and Hermitage grapes (also known as Cinsaut). I spent several years living in Botswana and working in the Ministry of Agriculture in the 4B youth program as well as got to return to the region on a Rotary Group Study Exchange (GSE) Program. I spent time quite a bit of time in the South Africa wine country of Paarl and Stellenbosch and grew to love Pinotage. We planted this variety in our own vineyard simply out of our own curiosity and it has proven to be a nice addition. This year we are expanding the number of Pinotage vines we have in the ground. Let me say upfront that I am not a wine-o-phile. See that’s not even the right word. It something like enophile. Either way, I simply enjoy a glass of wine now and then. To me wine is like food, every one likes something different and it’s OK to enjoy what you like, not what some expert says you should like. Having said that, I tried my hand at wine making and it is not a skill set that I possess. I have dumped more of my own attempts than have consumed my own wine. I blame it on the fact that by the time I am done working in the vineyards and bringing in grapes from harvest, the last thing I really feel like doing is messing around with more grapes in my free time. I will leave it up to those who possess that skill set and buy what I need! A cluster of Sangiovese grapes from our vineyard. So we got involved in grapegrowing as part of our efforts to add value to each acre of land that we farm. In 2000-2001 when we first starting looking into winegrapes, there were 12 wineries in Maryland and there was a demand for locally grown grapes. We spoke to each of the wineries in existence then and got an idea of what they wanted to use for fermenting wine. We planted our first 3 acres in 2003. At that time, there was about 125 acres of grapes in the Maryland. Since that time, the industry has grown to a current number of 55 wineries and approaching 1000 acres of grapes planted. Granted, it is still not a huge wine industry, but the growth trajectory has been steep over the last 10 years and interest in the vineyards and wineries is still high. To further diversify our farming operation, in 2009 we started offering custom vineyard work for area vineyard owners. We formed Schmidt Vineyard Management LLC and have been busy ever since offering vineyard management services to vineyard owners throughout our region of the state. While still an emerging industry, it is exciting to have launched a new business successfully and further diversified what our 3rd generation family farm can do to continue practicing and promoting a variety of agricultural markets. Yesterday, we started vineyard installations for 2012. We were planting a few additional acres for a vineyard in Caroline County, Maryland who is planning a start up winery in 2013. We planted 5 acres for the owner last year, are finishing out the back field this year while they draft up their winery design and layout to break ground this fall. We planted Cabernet Sauvignon. Landot Noir, and Chambourcin for them. Today, we are in Kent County, MD planting Sauvignon Blanc, Chardonnay, Riesling, and Muscat for another customer. We have another Kent County customer to expand their vineyard. By the end of this week, we will have planted 10 new vineyard acres and over 13,000 vines. I decided to try my hand with my new iPad2 and take some video of the crew planting grapes. Here is a video link to our crew planting Cabernet Sauvignon in the vineyard expansion yesterday so you can see how we install vineyards. It is my first YouTube video. I’m not ashamed to tell you that I had to go to a free Wi-Fi site about 20 miles away to upload it because my rural internet service tanked on me every time I tried to do it from home! Hope you enjoy a little sip of wine while you watch this short video!